I have been thinking lately about how we live in traditional spaces. Do we merely replicate the styles of the past, or do we incorporate aspects of modernity, creating design which springs from our contemporary attitudes while acknowledging the past? I think this is territory many of us navigate, in our own way, and with our own budgets and tastes. The challenge is to keep our preferences for certain styles — let’s say mid-century or Scandinavian furniture –modern, so that our passion doesn’t turn to pastiche. 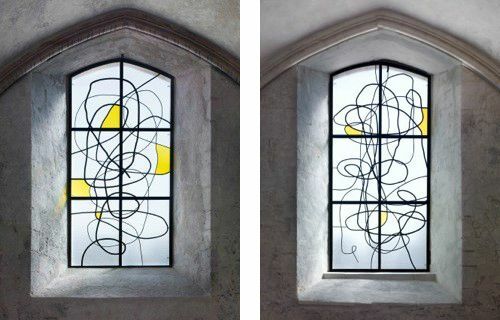 I appreciate how the artist Christopher Wool incorporated traditional stained glass techniques with painterly style and Mondrian-like color to create this permanent installation at chapel at La Charité-sur-Loire. The simplicity of the line compliment the arch of the Romanesque vault ceiling. It is an artistic expression, attuned to the act of prayer. It is an applied gesture, and doesn’t transform or overwhelm the SPACE. It is decorative; it is flat and surface like many traditional stain glass windows; and yet it feels appropriate and quiet for an abbey, where prayer resides. 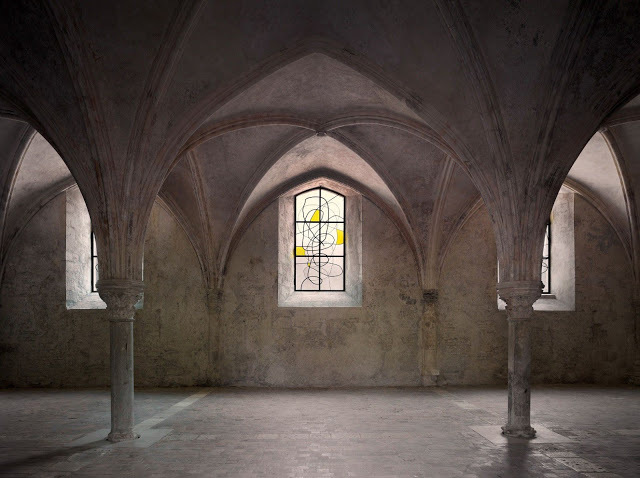 As a counter to this feeling, I am thinking of the sublime beauty realized by le Corbusier at Notre Dame du Haut at Ronchamp, where the architecture and stained glass windows create a tremendous sense of activated space. Or even the striking beauty of Stephen Holl at St. Ignatius in Seattle. In these two examples, the architect created the space and the windows together, in an effort to create a sense of volume. There effect here is much closer to the stain glass windows at Chatres Cathedral, a place were the sense of awe aids the spirit of worship. Snapshot is a Tuesday series of inspiring images — things that interests me now…oops! Guess I’m off by a day this week.